More rain and gale force winds are expected as Category one Tropical Cyclone Mona moves closer to Fiji. 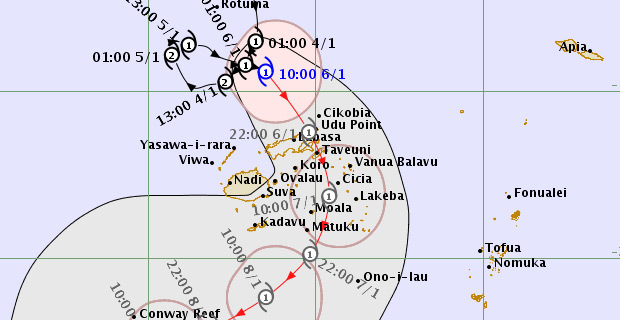 Cyclone Mona continues to track towards Fiji moving East-Southeast at about 16km/hr. Nadi Weather Office Senior Forecaster Amit Singh says based on projections, Tropical Cyclone is still expected to track toward Vanua Levu. He adds that there is a clearer projection that the centre of Cyclone Mona will pass more toward Udu Point later this evening. Cyclone Mona was located at about 250km North-Northwest of Labasa or about 270km North-Northeast of Yasawa-i-rara at 10 o’clock this morning. Singh says that as the system moves closer to the Fiji group there is a low chance for Cyclone Mona to pass close to Viti Levu. He says that there is a low chance for the centre to pass over Viti Levu. Cyclone Mona has winds of about 85km/hr with momentary gusts of about 120km/hr close to the centre. Singh says that gale winds associated with Tropical Cyclone Mona extends to about 150km from the centre. People can expect damaging gale force winds several hours before the cyclone centre passes overhead or nearby. On the forecast track the centre is expected to be located about 60km East-Northeast of Labasa or about 80km North-Northwest of Taveuni 10 tonight. A gale warning remains in force for Yasawa group, Cikobia, Vanua Levu, Taveuni, Rabi, Qamea, Kioa, Laucala, Matagi, Lau and Lomaiviti groups and Kadavu. 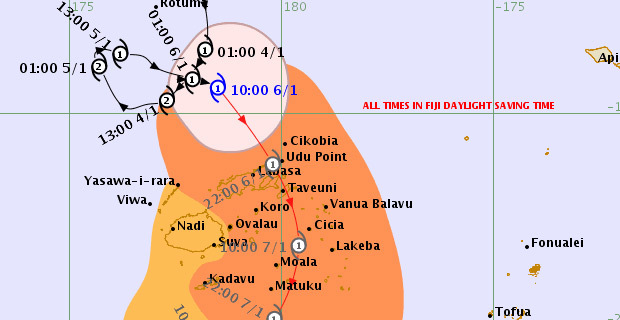 A Tropical Cyclone Alert remains in force for the rest of Fiji. A Heavy rain warning remains in force for the whole of Fiji. A flood warning remains in force for all low lying areas, small streams and areas adjacent to major rivers of Fiji.